We’ve all got different ideas of what minimalism means. Today I'm sharing my definition through a free excerpt from my book, Minimalist Living: Decluttering for Joy, Health, and Creativity. The word “minimalism” comes to us from the world of art and design. It’s the less-is-more aesthetic that you’ve experienced if you’ve ever been in an art museum and found yourself pondering a canvas simply painted in one solid color. I use minimalism here to describe a similar attitude toward our stuff, our thoughts, and our lives. When I talk about minimalism, I mean something that is different for each person. Although minimalism in this context isn’t the term used to describe a certain style of art or design, some of the connotations from that world can inform our definitions of minimalism. For example, to some, minimalism means clean lines, white space, simplicity, and a less-is-more mentality. But that conventional definition of minimalism won’t necessarily apply to everyone as they think about what kind of place they want their home to be or what they want their life to look like. Well, the answer varies for each person, but first and foremost, a minimalist lifestyle is about increasing your joy through simplicity. It’s all about what gives your life meaning and makes you happy, and nothing more. • Letting go of that which does not serve you. • Designing your life based on how you want to live it, not the expectations of others. • Letting go of negative or obsessive thoughts. • Being surrounded by colors and textures that make you feel good. • Putting furniture in rooms to reflect how you really live, instead of how other people live. • Creatively using one item for more than one purpose. • Borrowing from friends or neighbors, or renting, if you use something rarely. • Giving unused things away now, not later. • Knowing that you have what you need and it is enough. • Spending money on experiences and adventures. • Saying “yes” to every request on your time. • Keeping things out of guilt or a sense of loyalty to someone. • Making sure your home looks like it could be in a décor magazine (unless that’s truly your passion). • Having a couch and a TV just because everyone else does. • Having a gadget for every possible whim you might have. • Filling an attic, garage, or basement with things for the kids in case they ever want them. • Keeping something because it’s easier than recycling it or giving it away. • Keeping something only because it’s worth a lot of money. • Renting a personal storage unit long term. • Spending money on possessions that require maintenance or management. 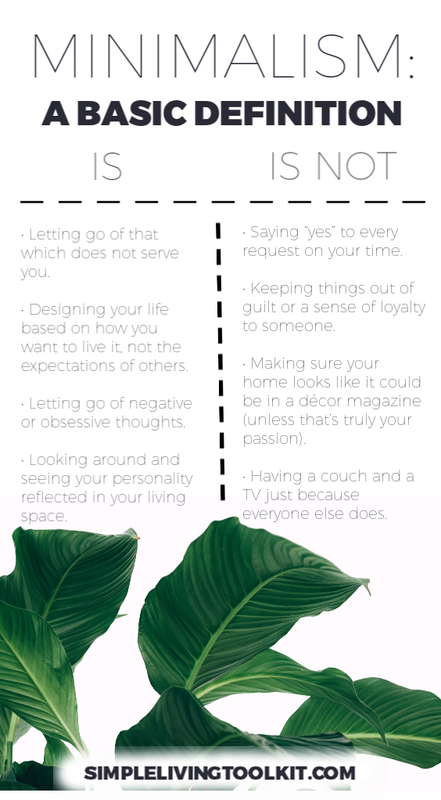 Do these lists help you define minimalism for yourself? I hope you found this post to be a great reminder of why you're part of the simple living movement and of what minimalism can do for you.